Last year I had the opportunity to interview Bob and Jenna Torres of Vegan Freak fame. Like most of the activists who gave me suggestions for Striking at the Roots, they offered more input than I was able to fit into the book. But with the advent of this blog, I’m able to post all the advice these authors and podcasters had to share. What impact do recent media advances like blogging and podcasting have on animal activism? Bob: The Internet is a wonderful tool, if only because it is radically democratizing. Instead of being rigorously hierarchical, the Internet is more rhizomatic, and it allows for interconnections between people that previously were impossible. This relatively non-hierarchical structure means that we no longer have to be dependent upon large, managed organizations to participate in this movement. We can begin to build something unique, authentic and truly grassroots, rather than the Astro-Turfed populism of the national organizations like PETA or HSUS. The power in using the Internet as an organizing medium to route around the big groups is that we can begin to see truly genuine and unique ideas channeled into activism, rather seeing human creativity forestalled by organizations that call donating money “action.” I also predict that we’ll see increasing empowerment of individuals and more local groups as technologies like podcasts, videocasts and the like become increasingly easy to use. The upsides are tremendous. When we no longer have to rely on “professional” activists and their overpaid CEOs and directors, everyone can be an activist, everyone can be an organizer and everyone can begin to easily work for the abolition of animal exploitation. Can you share a story that demonstrates how your outreach activities have had an impact on the movement? Jenna: Bob and I started a vegan podcast (Vegan Freak Radio) and forums in 2005. Being vegan wasn’t enough for us; we wanted to do some activism to share our enthusiasm about veganism. Both the podcast and the forums have been successful beyond what we could have ever imagined in terms of vegan outreach. When we first started our podcast, we envisioned that it would be a support network for people who were already vegan; but as time went on, we realized it was not only that, but also a tool to let people know about the various reasons for going and being vegan. I can’t tell you how many emails we get from listeners to our podcast who have gone vegan after something we said reached them, and for everyone it’s something a little different that resonates. We started the forums on a whim after publishing our book in 2005. We thought that it would be a simple place to discuss where to get vegan goodies and chat with other vegans. Since we started, we’ve seen the forums grow into a vibrant community of vegans who act as a support structure for each other. Many of the people on the site didn’t know any other vegans when they signed on; the forums give them a place where they don’t feel so alone in their joys and frustrations, and I think many of them are more likely to stay vegan when they realize that there are plenty people out there that are like them. The forums have also been a place where people join together and encourage each other in different types of activism — both virtual and in real life — including letter-writing campaigns, leafleting, cooking classes, art, zines or just acting as a vegan mentor for those around them. The forums have even created real-life community as well. Since we’ve started, there have been meetups all around the world, and we’ve even had two couples who met on the forums get married. We do both the podcast and the forums on a shoestring budget but have gotten amazing returns in terms of getting people to go and stay vegan and fostering a community that then encourages further creative activism. What advice would you offer someone who either wants to use your techniques in his/her activism, or wants to do anything at all for animals but doesn’t know how to get started? Bob: This sounds cheesy, warm and fuzzy and kind of grade-schoolish, but I always say — half jokingly — that each of us is a unique and individual snowflake. Though my term makes fun of the idea, I do truly believe that each person has the ability to leverage their unique talents and ideas for the movement. Everyone has some talent, and my advice is always to use whatever talent you have to support the movement. Many people tell me that they just can’t stomach protesting, leafleting or anything that involves directly confronting people. But that person who doesn’t like to leaflet could maybe serve as a support person by providing warm drinks, a hot meal after the demonstration, rides for folks without cars or even designing some posters. The point is, we all excel at different things, and we just need to find people with whom we can work to leverage all of our individual talents together. Everyone has something they can give, and it may require a little creativity to figure out how to make it fit, but with some effort, you can find something. Ultimately, I don’t believe in just sitting back and letting professional activists do the activism for you. Activism and outreach are wonderful tonics to the occasional aggravation, frustration and helplessness we all feel about the ways animals are treated in our society. Activism is empowering, and there’s nothing more rewarding than making a changes — however small — in our society. Giving money to groups you support is important, but it shouldn’t be all that you do. Similarly, being vegan is important, but it shouldn’t be all that you do. If you want animal exploitation to end, you have to get out there and fight for it in whatever ways you can. We need as many voices as possible in this fight. Where Have All the Activists Gone? An article on student activism in the September/October issue of Mother Jones won’t surprise many people with this factoid: campus movers and shakers are moving and shaking a lot less than they did a generation ago. Of course, the ‘60s gave us such global concerns as civil rights, the Vietnam War, labor reform, women’s rights and part of the presidency of Richard Nixon. There was a lot to be angry about. Though the graphic in the magazine depicts a PETA demonstrator, only 1 percent of students surveyed identified animal rights as an important issue to them. (The number-one issue? Human rights.) While unfortunate, that statistic is aligned with the percentage of people in our society who identify themselves as vegan. The Internet has revolutionized all kinds of activism, of course, and animal activism seems to be riding the techno wave as high as anyone. 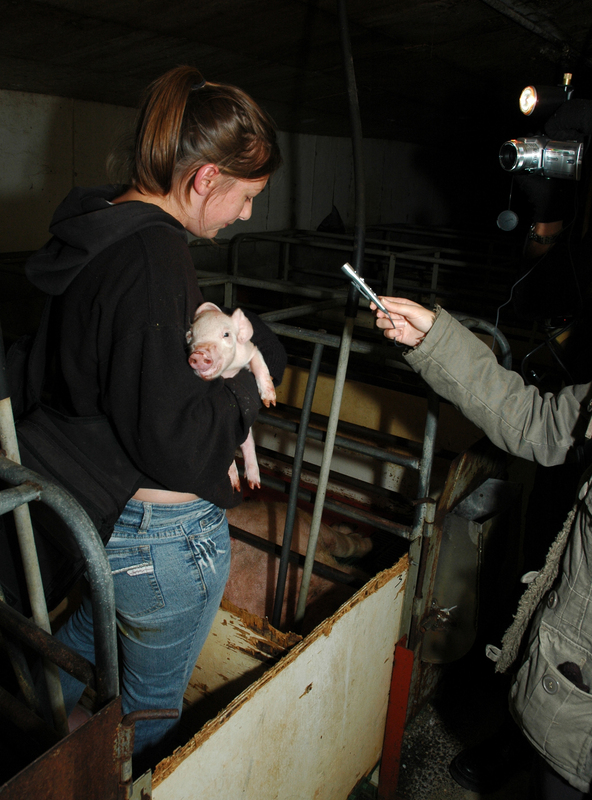 Activists are going online to locate factory farms. They’re blogging about veganism and podcasting about animal rights. They’re posting undercover video footage on sites like YouTube. Emailing has become this generation’s phone tree – or at least it was until 5 minutes ago when it was replaced by text messaging, which will soon be replaced by some higher-tech mode of communication, possibly involving the aid of a strange alien life form. Is all this a good thing? Yes, I think so. Nothing in the animal activist’s toolkit is as powerful as the sight of a biomedical researcher, circus hand, fur farmer, poultry processor or puppy mill owner abusing animals, and with the Internet, we have the ability to put these images online in seconds, lifting the veil for anyone with broadband access. Social networking sites like MySpace and Facebook, meanwhile, allow activists to connect like never before to share ideas, organize campaigns and generally engage in cyberactivism. Animal exploitation is probably just as important to us as any of the issues of the ‘60s were to our parents. Instead of burning draft cards, we can ignite the rage of consumers by showing them – really showing them – how their choices affect the suffering of animals. After all, we have a lot to be angry about too. pattrice jones with Franny the hen and cats Pearl and Pyjama. “In recent years, a hardline ‘abolitionist’ position in which efforts to improve the well-being of currently existing animals are condemned as ‘welfarist’ impediments to the future liberation of animals has gained momentum within animal advocacy. The absolutist style of discourse favored by the most vocal proponents of this position has had the effect, over time, of obscuring the important distinction between true ‘welfarists’ — such as members of the ‘North Carolina Responsible Animal Owners Alliance,’ who believe that animals are rightly property but who argue that animals ought to be treated humanely — and true animal liberationists who support measures to improve the welfare of animals either as interim measures or as steps in a strategic plan for the liberation of animals. Thus such prominent women in animal liberation as Ingrid Newkirk of People for the Ethical Treatment of Animals (who has argued that any recognition of any animal rights by legislators is a step toward the recognition of full rights) and Karen Davis of United Poultry Concerns (who has argued that the interests of individual existing animals ought not be ignored by humans who purport to speak for animals as a group) has been mischaracterized as welfarists, often in quite insulting terms. Such derisive mischaracterization has created a bullying atmosphere in which persons who are less certain of their position in the movement may hesitate to depart from doctrinaire opinions for fear of being similarly smeared. Female activists, in particular, may shy away from expressing concern for the welfare of actual animals for fear of being labeled soft-minded or sentimental. This state of affairs makes it difficult for activists to collectively talk through the nuanced details that always must be discussed when people try to put principles into action in the real world. “At the same time, some proponents of animal welfare legislation also have engaged in discursive practices that make productive debate difficult. Here, the distinction that has been blurred is the all-important difference between condemning specific inhumane practices and promoting ‘humane’ exploitation of animals. While most animal rights organizations that sponsor or promote animal welfare initiatives are very careful never to cross that line, a few high-profile slip-ups have given an aura of legitimacy to the mistaken equation between the abolition of specific factory farming practices and the promotion of ‘happy meat.’ Gratuitous public insults of imprisoned animal liberation activists by proponents of more moderate tactics amplify the illusion that working for ultimate animal liberation and caring for animals in the here-and-now are necessarily two different projects. The opacity and lack of accountability of the upper echelons of national organizations promoting welfare initiatives has, like the discursive stridency of some abolitionists, made productive dialogue difficult. Disenchanted and angry at powerful organizations that neither explain their actions nor accept responsibility for their impact on the movement, grassroots activists who ought to be helping to think through and implement the coordinated strategies we will need if we are ever to make more than a dent in the production and consumption of animals retreat into alienated silence or join the ranks of the ‘abolitionists’ actively working to undermine efforts to reduce ongoing animal suffering. In addition to being a long-time activist, pattrice is an author, public speaker, blogger, teacher, sanctuary founder and much more. I encourage all activists to devote some time to carefully reading this well-considered report. Deirdre Sims holds one lucky piglet. One of the most active animal-rights groups in the world, New Zealand Open Rescue has carried out rescues and investigations in chicken, egg and pig farms, placing rescued animals in loving homes. The group formed in 2006 after a number of animal advocates became increasingly frustrated with the New Zealand government’s lack of real action for animals on factory farms. “Twenty years of campaigning against factory farming using legal means such as protesting and lobbying saw little to no changes for animals,” says Deirdre Sims, one of the group’s founders. New Zealand Open Rescue’s aims are to openly rescue animals from places of abuse, to expose hidden suffering and to consistently provide irrefutable evidence why factory farming should be banned. Deirdre says their long-term goal is to abolish factory farming, but in the meantime, they work to raise awareness. Their investigations and rescues are certainly doing that as they grab headlines and disseminate their own press releases. They also speak to the public. Click here for an interesting interview with Deirdre. Senator Barack Obama and his wife, Michelle, have promised their daughters that win or lose in November, they are getting a dog. The Clintons had Socks. The Bushs have Barney. The tradition of a First Dog or First Cat goes all the way back to George Washington, who had more than 30 hounds. The American Kennel Club is offering to help the Obamas find a dog, but most animal advocates would like to see them rescue a companion animal. “With 3 to 4 million dogs and cats killed in public and private shelters, there are many lives to be saved, and the simple act of giving a home to a dog who might have faced euthanasia would do wonders for the cause of adoption from shelters,” says Wayne Pacelle, president of the Humane Society of the United States. Please contact Barack Obama and urge him to consider adopting a dog from a shelter or breed rescue group. Update: The Obama family has announced they plan to adopt a dog. Thanks to everyone who contacted the Obamas to voice your support of rescuing an animal from a shelter vs. buying from a pet store.